It's time for one of our favorite events of the year! Each Spring, the library throws all of the rules out the window and hosts an afterhours party! This year's party in the book stacks will feature live music from Jim Brunner, wine/craft beer from Simmons Winery, appetizers from Queens's Cafe and Bakery, and desserts from Stephanie Joest. GET TICKETS! Let us know how we can help you! Make an appointment. The Friends of the Library Used Book Store is open in the library’s annex. Shop anytime during library hours! Great deals on used books including some antiquities! Find what you are looking for through the library's catalog. Reading App. 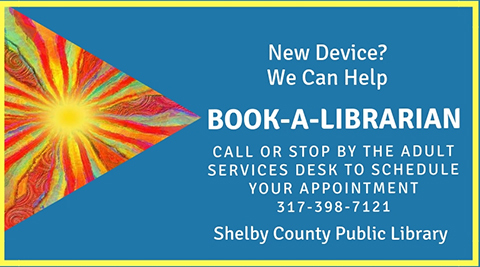 This is perfect for getting eBooks/Audiobooks on your mobile device. It connects directly to Overdrive's Catalog. "I just have to say wow. Checkouts are much easier. Thanks for a very user-friendly app." Open Source Integrated Library System. Our library's catalog is connected to over 100 libraries in Indiana. Search the catalog, place a hold on an item with your library card, and pick it up at the Evergreen Library of your choice. eIndiana Digital Consortium. If you want to access eBooks/ Audiobooks and are connecting to a desktop computer, laptop, or Nook, we recommend Overdrive. Otherwise, please use the 'Libby' App for phones and other tablets. One of Indiana's original Carnegie libraries. Let the library help you search your ancestry. Get involved with the library. Check out our new used bookstore! for your meeting, party, or gathering.